We recently visited the coastal city of Savannah, and we fell in love with the charm, the trees, the moss, the warmth of the people, and all of the parks! Someone (Oglethorpe) really new what he was doing back in the 1700’s when he laid out the town. Every few blocks is a block set aside for trees, and grass, and the usual glorious statue or monument. There is a laid back atmosphere where one can relax on a park bench from the stress of life, enjoy the bead of sweat on the brow (know that’s just the way it is), and then look forward to a breeze which is sure to blow through at any moment. We spent hours walking around the city soaking it all in. The sound of horse hooves, the clippity-clop on the brick streets below our room, was a delight. One spot in particular, though, you must visit. Forsythe Park, the largest park in town, has a beautiful fountain which beckons from all directions. We were drawn to it because the light from above it was not blocked by the huge oaks we were under. It seemed to glow on its own while the sprays of water made the atmosphere touchable and present. 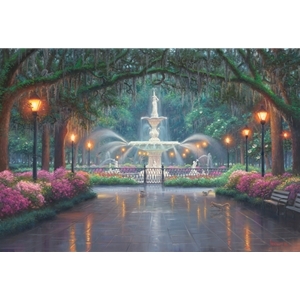 I wanted to combine the best elements from the city, the moss in the trees, the azaleas of spring, and a few of nature’s critters interacting in a peaceful song, Savannah Serenade.